We’re not sure how long this has been available but the Samsung Galaxy S 4G (Refurb) is available for prepaid customers for the cool price of $349.99. Actually it’s not technically “available” as they are out of stock but constant refreshing of the screen on a daily basis might yield one for your purchasing pleasure. Hit the link below to start trying! ← Will AT&T Honor T-Mobile Dealer Agreements Or Leave Them Out In The Cold? Do they have any new prepaid phones coming out? 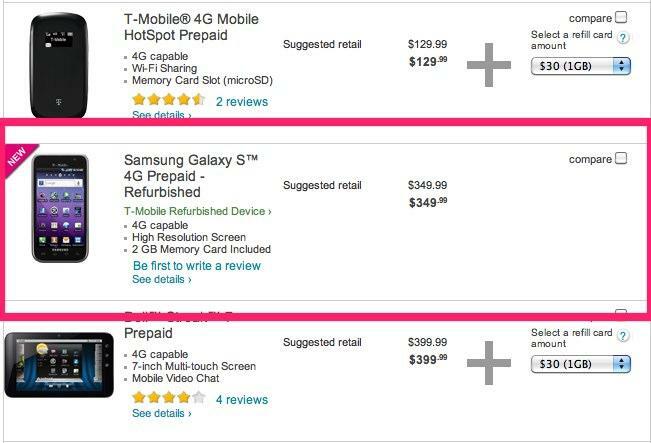 Which is better T-Mobile prepaid or at&t prepaid? I sold my Vibrant in anticipation of getting one of the superphones debuting this year. I thought I could mark time with the G1, but that’s impossible once one has enjoyed a 4″ SAMOLED display and FroYo. So looking for an inexpensive Android-based phone to use in between superphones I bought an Optimus T on eBay, for $130. Based on using that phone for three months I can say that phone you have is a sweet deal. It’s plenty fast, has a great display, and is nicely compact. The only thing I didn’t like about the LG is that although it came with Android 2.2 it could NOT run Adobe Flash, so it did not came with flash capability. If one can do without flash support (meaning no Net based video) the LG Optimus T is the best deal on the Net in terms of a great phone for the price. I like the LG so much I am saving mine as a backup phone should I lose or damage my Samsung Galaxy S 4G (that I also bought on eBay for a great price). Also plan to use it for sports activities since the Optimus T is a sturdy phone too. Bonus Comment: I explored the idea of rooting the LG and installing a ROM with flash support. I got the SGS4G so I stopped researching. But the information I found was that 1) it could be done; 2) that the Optimus T does not have the hardware capability to run Adobe Flash, that’s why it does not come with it; but 3) there’s YouTube videos showing the Optimus T running even Gingerbread, with tutorials on how to do it; so 4) I suspect the Optimus T can run Adobe Flash. Definitely T-Mobile. Imagine you can use $1.5/day internet on MyTouch 4. At&t cuz they have unlimited txt,picture and video messaging and unlimited minutes for 60 bucks. Don’t people look around? Cuz everyone is saying T-Mobile I got the lg trive at my local att store I didn’t even need an internet plan! I got the unlimited calls and txt which includes picture and video messaging and im for 60 bucks! So I don’t have to worry about going over my minutes cuz they unlimited. Ummm T-Mobile’s $50 plan gives you unlimited minutes, unlimited messaging, and data with the first 100MB up to 4G speeds. How is the AT&T $60 GoPhone plan better again? I have prepaid currently and have not had internet working in over a week – I have made at least ten calls to customer care and of course that is a joke.. still not working! I guess the reason is the high return rate due to low apolication storage. This is a good price. Samsung Galaxy would sell well if the price is kept down. I may even buy one if Samsung keep the price at this level. There is nothing cool about that price; you can get one brand new on eBay for less than that (like new for much less at auction). You don’t get the full warranty on refurbished phones so there isn’t much point in paying more for one direct from T-Mobile. One of the things holding prepaid from taking off (whether T-Mobile, Boost, Metro, or others) is the lack of nice phones, handsets that might even come close to competing with even carriers’ mid-range phones. In April 2011 Metro PCS prepaid debuted the Samsung Indulge, the first 4G LTE in the U.S. It has a physical keyboard, 3.5″ display and runs FroYo (Adobe Flash capable, only in the $60 monthly unlimited plan, that’s $60 taxes and fees included). In these hard economic times and assuming T-Mobile’s value-conscious customers are looking for alternatives on news of the acquisition, I have to wonder if the refurb SGS 4G is T-Mobile’s competitive response to Metro’s 4G Indulge, especially since the Indulge is priced almost the same as the T-Mobile refurb SGS 4G ($299 vs. $349). I have a Samsung Galazy contract phone and I want to know if I can put a pre-paid plan on it ? hey I have a Samsung Galaxy contract phone. Do you know if I can put my phone on a pre-paid plan?